Prior to taking up the post of Dean of Duncan of Jordanstone College of Art and Design (DJCAD), Professor Harris was Head of Gray’s School of Art in Aberdeen. He graduated in photography from Birmingham College of Art & Design in 1980, and subsequently worked in broadcast television for a Channel 4 independent producer, the BBC, and ITV networks. From 1994, Professor Harris taught media production in a number of Scottish institutions, and was head of film and television at Edinburgh College of Art from 1994 to 2002. In 2002, he became Professor of Screen Media and subsequently Creative Director of the Institute of Arts, Media and Computer Games at the University of Abertay Dundee, where he was successful in attracting funding of over £9 million to deliver a number of innovation and knowledge exchange projects in support of Scotland’s Creative Industries. It was during this period that Professor Harris became actively involved in establishing the reputation of the Digital Media and Computer Games cluster in Dundee. Professor Harris has won numerous national and international awards during his career as a director, script advisor and executive producer of student work, including two Royal Television Society Awards, a BAFTA Scotland for best new documentary talent, and a British Academy Award for best short film. He has served on BBC Scotland’s Music, Arts & Entertainment, Independent Review Panel, was Chair of the Scottish Executive’s Moving Image Education project, a Board Member of Scottish Screen, and Chair of the Scottish Screen Lottery and Investment Panel, during which time he oversaw the funding of many Scottish films, including The Flying Scotsman, Stone of Destiny, and the Oscar-winning Last King of Scotland. 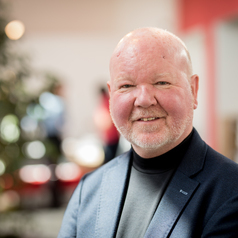 Professor Harris has been a member of the Advisory Board for the Centre for Excellence in Media Practice, and was until recently a member of Learning and Teaching Scotland's Advisory Council and main Board of Directors. From 2007 to 2014, he was a member of the Regional Advisory Board for Scottish Enterprise, Tayside. He was until recently a member of Scottish Enterprise’s Digital Media Industry Leadership Group, a Board member of Scotland’s sound Festival of New Music, and in 2014 he was appointed as an International Specialist in Cinema and Digital Media by the Hong Kong Council for Accreditation of Academic and Vocational Qualifications. He is currently Chair of Regional Screen Scotland.